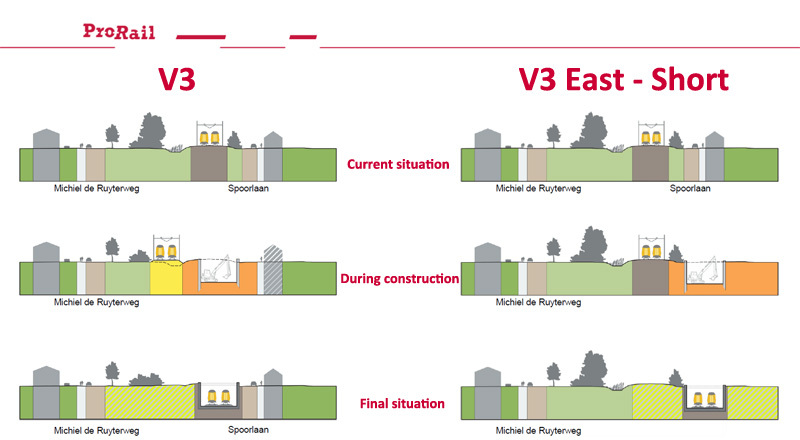 Even in the Netherlands decision makers and planners must often be reminded that the needs for people cycling should be taken into account when major infrastructure is to be reconstructed. This is something that is also done by the Fietsersbond (Cyclists’ Union) and their many volunteers across the country. Work that usually takes place behind the screens and that is therefore hard to visualise on my blog. But then I was invited by the Vught chapter of the Cyclists’ Union to join in a cycle tour to visit points of concern in the major road and railway reconstruction that will take place in their town. That offered a great opportunity to show how this works and so I gladly took it. 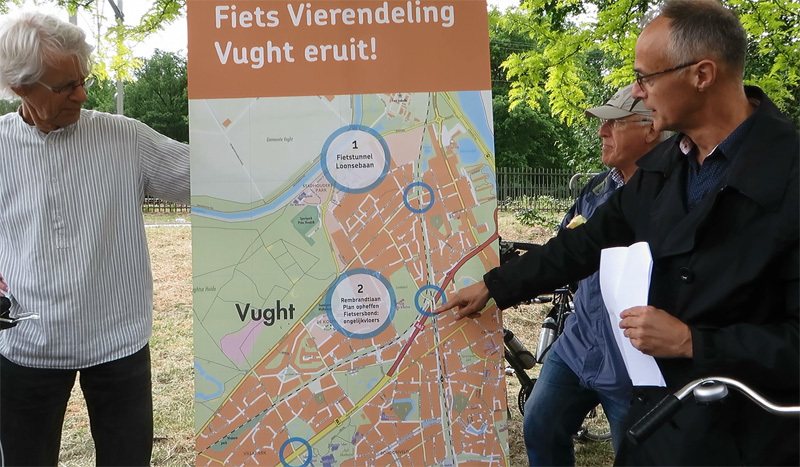 Many different people showed up for the cycle tour in Vught to visit important locations from a cycling point of view in a major plan to reconstruct infrastructure. Vught is a small town just south of ʼs-Hertogenbosch. It is divided by two railway lines and two major roads that form enormous barriers for the town. Especially the rail road that runs north to south on ground level is a particular concern. Many level crossings exist, but because of future plans with this rail road everything needs to change. The Netherlands’ railways expect 400 trains to pass Vught daily by 2020 because of the high frequency rail transport programme. That would mean that the level crossings would have to be closed for so long and so often that it would become very hard for people in the town to cross that railway line at all. That is why in the years to come big changes need to be made. There were many alternatives thought up, but recently a below grade railway line through the town with road crossings over that lowered line was thought to be the most effective measure. Even though that will cost the national government 125 million Euro more than a line at grade. Expensive, but lowering a railway line that is in use in a densely built up area is not so easy. Especially where that railway line is now running over a below grade motorway that needs to go over that railway in future. 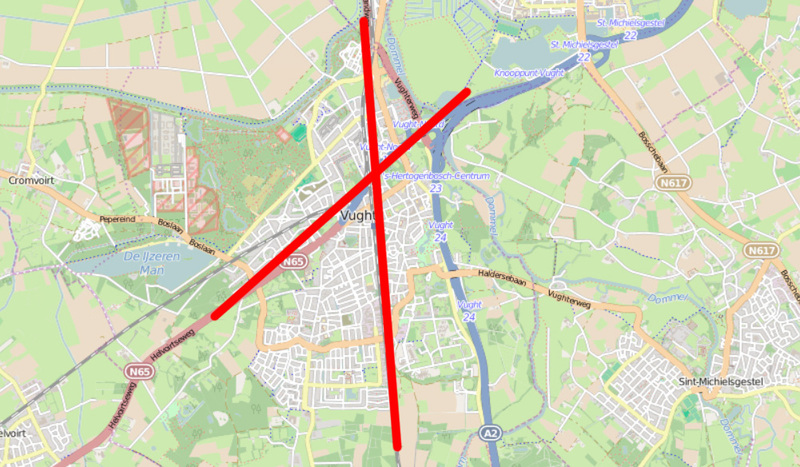 The railway lines and roads cut right through the municipality of Vught, dividing it roughly in 4 different parts. The A65 (called N65 where it is not a motorway) runs from Vught to Tilburg and where it is not a motorway it also runs on ground level through Vught. The crossings are already unacceptably dangerous and so that part of the road needs to become a motorway as well. The reconstruction of that road will be coordinated with the reconstruction of the railway. The passenger train frequency by 2020. There will be additional cargo trains. 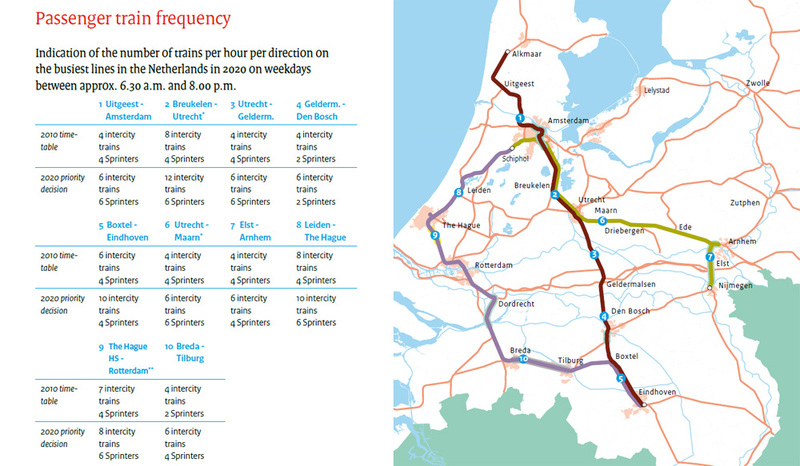 Picture from the high frequency rail transport programme (in English). 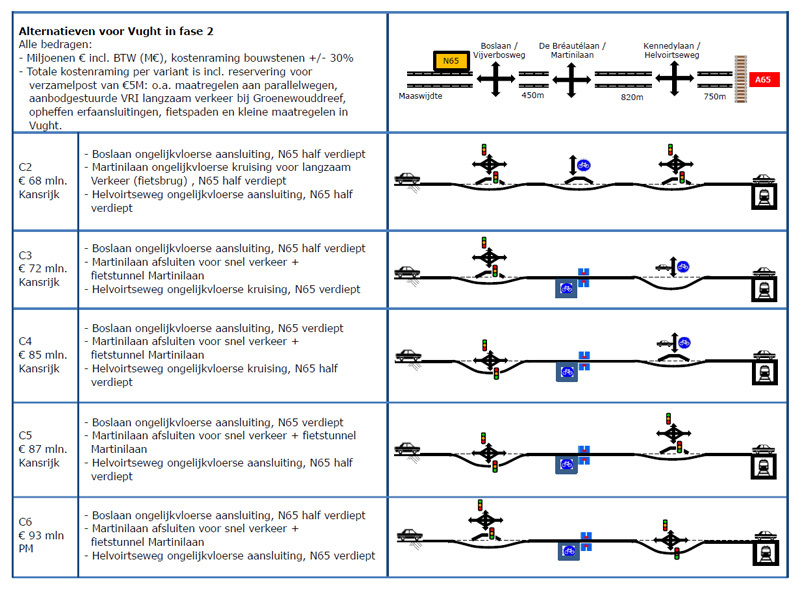 The line at Vught will have 6 intercities (express trains) and 2 sprinters (local stop trains) in each direction every hour during the weekdays. The costs of these two projects are huge. The railway (just at this location) may cost anything between 300 and 500 million Euro and the road between 68 to 93 million Euro depending on which of the many alternative solutions will be chosen. The actual building in these projects is projected from 2020 to 2025 for the railway and from 2021 to 2024 for the road. So why are we already talking about this now? That is because the plans are now in the stage that things can still be taken into account that may have been overlooked initially. In a later stage things will already have been planned so detailed and money will already have been allocated to specific parts of the projects, which would make changes much harder to make. How two of the many alternatives work out for the environment. In the different alternatives a very different number of homes will have to be removed. Now was the time to act on things in the plan that may work out less good for people cycling. So the local chapter of the Cyclists’ Union organised a cycle tour to visit these points of concern. That the 40 year old Cyclists’ Union is a respected organisation was reflected in the fact that people of all backgrounds joined the ride: local council members, provincial council members, cycle planners of both Vught and neighbouring ʼs-Hertogenbosch, representatives of Rijkswaterstaat, the department of the Ministry of Transport responsible for building the road and representatives of ProRail (who will be building the railway) so both politicians as well as planners. They rode together with members of the Cyclists’ Union and also the general public was invited. The tour got attention in the local newspapers, but it was not just a local event. The director of the Cyclists’ Union had come from Utrecht and also the representatives of Rijkswaterstaat and ProRail had to come from other cities. 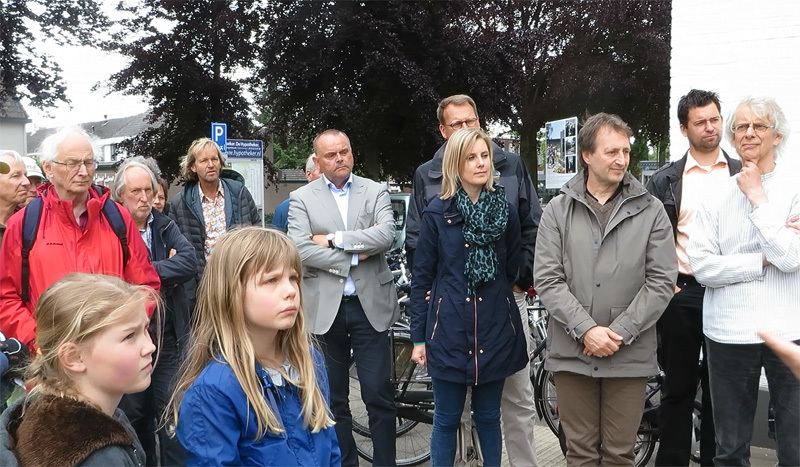 All these people, about 40 in total, were welcomed by the departing alderman for traffic of the municipality of Vught at the railway station. A number of solutions for the road with their costs and a brief description. The tour then went to the problem areas and it was good that the decision makers and planners actually experienced a cycle detour their plans would create. Closing a road on a map is easy, but experiencing the 500 metres or so detour on your bike and seeing what kind of a ride that is, with extra crossings, that is quite something else. But the Cyclists’ Union was not only pointing out problem areas, it offered good solutions for these problems and there were also some new opportunities in the plans that the planners had maybe not seen yet. Because the railway will run at a slightly different location there will be space for a new high speed cycle route right next to it. This is a long-standing wish in the different municipalities that the railway runs through. A representative of the local chapter of the Cyclists’ Union pointing at a portable map to make the consequences of the plans clear. 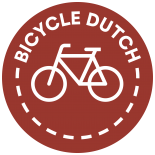 The main interest of the Cyclists’ Union is to reduce the barriers for cycling in the town of Vught caused by infrastructure under the responsibility of national organisations. The locations of the crossings with the future motorway were also visited. It is not yet sure whether that motorway will also be lowered or whether it will stay on ground level. That makes a lot of difference for the crossings and the Cyclists’ Union took this opportunity to give its view on the matter. The tour ended in a restaurant. After a short re-cap the participants could then further discuss some details of the plans over a drink. The local chapter did a very good job in organising this tour. I have shown you other examples of their work before. There was a tour with some elderly and a tour to ask for attention to road surfaces. But in this tour particularly they managed to get the right people to see the right things. The plans for these two huge projects will materialise further in the coming years. That cycling will get the attention it deserves in the plans should be secured now. Although the Cyclists’ Union will have to watch closely as the plans and the projects progress in the years to come. Ironic that a high speed motorway is used to A help cycling and B improve safety, at least at first glance. Many large cities in the U.S., such as Los Angeles and Chicago, have a street system that is built into a grid layout–a network of uniformly spaced horizontal and perpendicular placed streets. I haven’t noticed any Dutch cities on this website that have a majority of its streets built into a network like that. The advantage of having streets like this in the U.S. is that the parallel streets running next to the arterial streets tend to be predominately lined with residences, with many of them houses. Homeowners want very little motor vehicle traffic traveling, or parking for outsiders, along their street and if there is traffic it should be going about the speed of a bicycle. A bicycle rider will not only travel much slower than a motor vehicle, but the distance traveled will typically be less, which lessens the need for straight routes for bicycling long distances across the city. Where there is a great deal of traffic congestion during peak hours a bicycle traveling along residential streets can be quite competitive in going from point A to B compared to a automobile for distances up to 2 miles. When there is a very low mode share for bicycling in large U.S. cities and an arterial street system that is packed with motor vehicles during peak commute hours, then its very difficult to build a network of bikeways along these streets. Virtually none of the major cities in the U.S. have a complete network of bikeways because of this motor vehicle traffic congestion during peak hours. Dutch traffic engineering independent consultant Marjolein De Lange explains in this first video that there is enough space to put a typical Dutch bicycle junction design next to the Lambert bridge in London. But in the second part, she explains that there is not enough room to do this due to the volume of motor vehicles during peak hours. She states that Dutch bicycling principles is quite a big leap for these types of roads. Her suggestion was to slowly increase the amount of space in small steps for bikeways along these busy streets. Another way to increase the amount of bicycling in the U.S. would be to create a network of bikeways using mainly just residential streets. A research report entitled Low Stress Bicycling and Network Connectivity uses the city of San Jose California (pop. almost 1 million) to show how a bicycling network could be created using residential streets. Page 47 of the report illustrates the before and after if this was built. Page 48 lists the proposed improvements needed to complete this network. This could be very inexpensive to create as it mainly utilizes existing surfaces that cars travel on. It needs some form of direction or wayfinding to help guide the bicycle rider. Sharrows, which are almost completely useless for making bicycling less stressful on arterial streets, could be quickly applied to the roadway surface on residential streets to give directions to the cyclist. The chevron upper portion of the sharrow can be tilted in the direction that you want the bicycle rider to go. Putting up custom signs, diverters, traffic signals, or mini roundabouts can take considerably more time and money. When there is a very small mode share for bicycling there is probably very little staff or money available. There is not enough money spent to maintain most bridges and roads in the U.S. and so expecting cities to build a network of Dutch style bikeways is not realistic at this point. Here’s a Streetsfilms video where you can see sharrows used on residential streets to guide cyclists. Notice how the chevron is pointed to the right to guide the cyclists at 3:20 in the video. Los Angeles will have to start utilizing residential streets to make a network of bikeways throughout the city. Its quickly reaching a wall of resistance in taking lanes away from motor vehicles on major streets in order to install bike lanes. There simply is not yet enough bicycle riders to justify that swap for most city councilmembers in the most traffic congested parts of the city. First, do the simple stuff that is easy to achieve quickly, then work your way up to the more difficult questions. Using the more minor roads of a grid system for bicycle infrastructure seems like a good idea, but I don’t see how merely putting down some sharrows is going to do the trick. That basically amounts to not changing anything, but saying that a certain piece of road is now cycling infrastructure. That won’t work even in the Netherlands, let alone in a more car-dominated place. Instead, to make this work in my opinion one has to use a principle of filtered permeability – It has to be made impossible, or at least unattractive to use the residential roads as a through road or a rat run. One could for example make these roads oneway, with bicycle counterflow allowed, and with a change in direction of the oneway street at every intersection with a major street – and where possible halfway as well. You have to look at the potential for results in the context of where it is going to be used. Los Angeles, for instance, only has a bicycling mode share of 1%. Minor changes could increase the bicycling rate. In cities with much higher mode share, minor changes might have little or no effect in changing the rate of bicycling. With a small amount of money to work with due to the low mode share you also need to look at it from the standpoint of what is going to give the best return in increased cycling for the money invested in order to cover a large swath of the city. On page 6 of the report, it shows that there was a 22% increase in bicycling counts on streets that had sharrows (mostly residential streets) compared to those that did not have them, Streets with bike lanes increased ridership by 86% and bike paths had 391% more ridership. Putting sharrows on a street costs about $10,000 a mile in Los Angeles. Conventional bike lane installations cost about $50,000 a mile. Full treatment of creating low-stress bikeways on residential streets is estimated to cost $300,000 a mile on the bike plan. Bike paths cost 2-3 million dollars a mile to construct. Although arterial streets with no separation for bicycling have much more bicycle riders than residential streets, the cost per mile of sharrows is a fifth as much as a mile of bike lane. I have to assume that putting sharrows on residential streets is being used as a directional or wayfinding source by cyclists. The original intent of placing sharrows on a roadway was to show where cyclists should ride to avoid parked car doors. The Los Angeles Department Transportation has been installing sharrows on residential streets as a first step in making a bikeway there and mostly in areas of the city where they could not get the space to install bike lanes. They were required to use at least six different techniques to complete a bikeway on residential streets in the bike plan. Due to money restrictions they haven’t moved much beyond just using sharrows yet. Most residential streets in the Los Angeles have much lower traffic stress than arterial streets. The average speed and volume of motor vehicles is much less. The maximum speed limit posted is at least 35 mph on all arterial streets in Los Angeles. By California law, that means that 85% percent of traffic moves at least that speed. If merely placing sharrows on residential streets increases the cycling rate by 20%, then that indicates this is attracting more people to ride there than on streets that don’t have them. Notice that streets which only use a treatment of roadside signs that state this is a bicycle route and no roadway markings had no effect in increasing the rate of cycling. Its common in the city of Los Angeles communities just west of downtown for cyclists to use secondary streets. That’s due to this being a much more comfortable way to bicycle than on arterial streets. I don’t live in that area, but I have found that these secondary streets are much less stressful than having to deal with traffic on arterial streets which have no separation for cyclists. Many of the arterial streets in the core of Los Angeles have motor vehicle lanes that are 9.5 feet wide. The minimum required by the state is 10 feet wide. This creates a narrower space between the moving vehicles and parked cars. Most bicycle riders will naturally want to ride between the parked cars and moving vehicles on arterial streets when no separation is available. As the LADOT bicycle coordinator stated to me, every inch of space is spoken for. There really is no alternative but to use secondary streets to create a bikeway network in these areas. Separate space for bicycling on arterial streets is unobtainable at this point in these communities due to the high amount of traffic congestion during peak hours. This entry was posted on 18 August 2015 by Bicycle Dutch in Original posts and tagged advocacy, Cyclists' Union (Fietsersbond), infrastructure, urban planning, Vught.